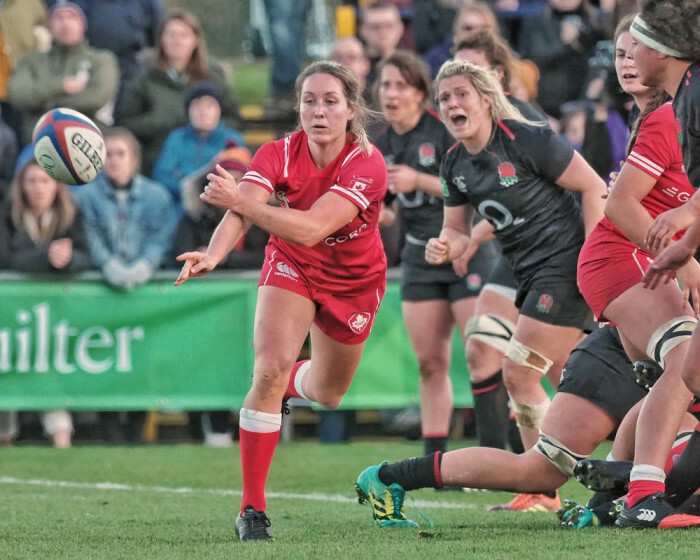 England took home a 27-19 victory over Canada, scoring five tries on the way to victory at Doncaster’s Castle Park in the second of their Autumn tests. In front of a crowd of 3,876, this was actually a record for a single ticketed test game for England - with bigger crowds in the past as part of double headers or free entry games, for example at Twickenham. This was the first test match of the year for Canada, the visitors were also capping seven new players in this game, and so it was no surprise that England, who hammered the USA last week, flew into an early lead. The England pack did the early damage with tries from Lark Davies and Poppy Cleall. The deadlock was broken after an England penalty was kicked to the corner and after the resulting lineout was driven to Canada’s line, Davies bundled over off the back of the maul for a first international try. Soon after, England found themselves in similar territory and a pick and drive saw Davies crash over for a second. Canada’s ill-discipline continued and after another penalty was kicked to the corner, the resulting rolling maul saw Cleall barge over for 15-0 with none of England's tries being converted. The visitors got back into the game in added time after Alex Tessier latched onto Anaïs Holly’s clever kick through to dot down and Brianna Miller's conversion reduced the deficit to eight points at the break. Canada had a second through Elissa Alarie’s near length of the field try following an interception in her own 22m. However, England came fighting back with the introduction of Katy Daley-Mclean settling the side and Kelly Smith showed good strength to go over in the corner while a fifth try soon followed with Scott’s pick and go from a metre out under the posts. Canada had the last say of the game with Courtney Holtkamp bundling over from close range with Magali Harvey converting. England Head coach Simon Middleton said: "It was really, really tough. Canada brought exactly what we thought they would, they were physical and fit and kept going to the end. "It was a real test for us. We gave a lot of ball away, but among it all there were some really good performances and I thought the forwards were outstanding. "We are a work in progress, the experience we had in the pack versus the inexperience we had in the backs showed today but the younger players will learn a lot from this. We talked of a squad effort and the finishers who came off the bench were outstanding." Continuing on their four-game tour, Canada “A” will face England “A” on Wednesday before Canada’s match against Wales the following Saturday. England play Ireland next weekend. Canada: Alarie, Harvey, Thibault, Tessier, Poulin, Holly, Miller; DeMerchant, Russell, Menin, Beukeboom, Holtkamp, Senft, Slevinsky, Nelles.